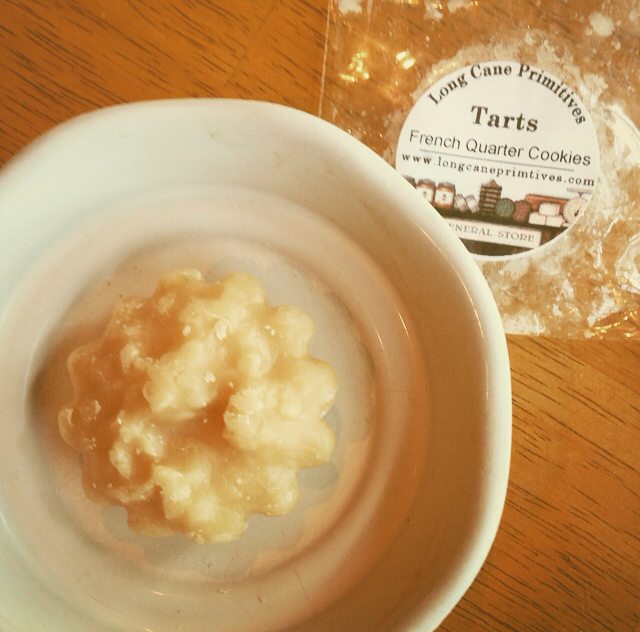 Long Cane Primitives: French Quarter Cookies- This banana bakery scent knocked it out of the park for me! The throw was strong and the banana was ripe and realistic with a toothy cake and cookies spiced with a touch a cinnamon. I have melted most of my recent LCP order and would repurchase this scent, Cinnamon Broom and the Noel and Toasted Blue Ribbon Cookie blends. 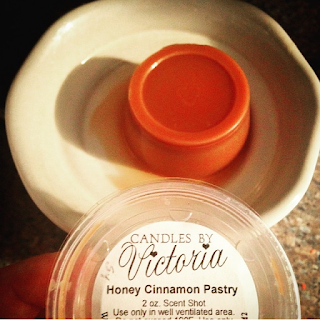 Candles by Victoria: Honey Cinnamon Pastry- My very first CBV tart, given to me by Deb as a gift. I really enjoyed it! It melted all the way through, gave a nice strong throw and smelled like spicy honey. Not very much bakery. I will say that Savanna did not like it and said it "stinks." I probably won't repurchase since I try to make sure everyone enjoys the way the house smells and they so rarely complain. I would like to purchase from CBV, but the shipping is too high for me. So I probably won't anytime soon. Lasting Scent Candles: Spring Mountain Mint- I melted this early on and didn't get a photo of it. Sorry! But it was a bust anyway. The scent was too light for me even in my bedroom. It was a watery clean scent with very little minty sharpness. It was pretty clean and fresh but just not enough oomph. Thankfully it was a fluke, because most of what I have been melting from my LSC order has been much stronger. Bombshell threw strong for two days. But I would not repurchase Spring Mountain Mint. I did get another LSC order in! YAY! Those are some of my recent melts. Please don't forget you can request ANY scent to be reviewed in depth from my current melting basket! Yes the first two were quite cozy and strong. They can't all be winners though :-) Hope your Saturday is going well and you feel better my friend! Glad you liked the CBV. I have a couple more sitting here that I can send your way. One is apple something, and I can't remember the other offhand.